Died: Apr 18, 1955 (at age 76) in Princeton, New Jersey, U.S. Awards:Time Person of the Century (1999), Max Planck Medal (1929), Copley Medal (1925), Nobel Prize in Physics (1921), and Matteucci Medal (1921). The name Einstein and the word genius have become almost synonymous ever since the theoretical physicist unveiled his theory of relativity. Combined with quantum mechanics, these form the basis of modern physics. Einstein is also responsible for perhaps the best known formula in history, E = mc2. He received the Nobel Prize in Physics in 1921. Albert Einstein was born on March 14th, 1879 in the German city of Ulm. His father Hermann was a salesman and engineer. A year after he was born, his family relocated to Munich where his father and uncle established an electrical equipment manufacturing company. This event in his early life may have set the stage for his interest in science and mathematics. His father would share his engineering knowledge with the young Albert who thrived on learning about how things worked. Albert’s formal education began with him attending catholic schools even though he was of Jewish descent. His family did not actively practice the Jewish faith. Over the years his education was a varied one and he never hid his disdain for organized teaching. He attended several different institutions of learning in a number of locations. Einstein married a woman he had met at the Swiss Federal Polytechnic in Zurich. The marriage occurred about one year after he fathered a daughter by the woman. There is some mystery as to the fate of the baby. Some believe the girl may have been put up for adoption while others think she may have died after contracting scarlet fever while still an infant. The couple would have two sons before divorcing in 1919 after 16 years of marriage. Einstein would marry his cousin a few months later, after having begun a relationship with her 7 years prior. Einstein visited the United States for the first time in 1921 with New York City as his initial destination. He lectured and was celebrated in the country for three weeks. He also went to Washington D.C. during the trip and visited the White House while there. The following year, Einstein would begin touring Asia giving lectures in places such as Japan, Ceylon and Singapore. In Tokyo he would meet the Emperor and Empress of Japan at a reception in the Imperial Palace. His journey would then take him to Palestine, where he would come to appreciate his Jewish origins. Einstein emigrated to America in 1933, unhappy with the Nazi regime that had come to power in his native Germany. He became a U.S. citizen in 1940. Besides the theory of relativity, Einstein’s contribution to science is unparalleled in its depth and magnitude. He was responsible for literally hundreds of article and books as well as collaborating with other scientists on numerous occasions. 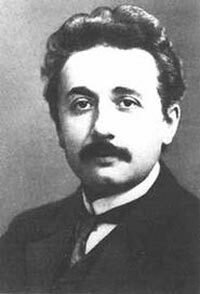 Einstein’s Annus-Mirabilas Papers of 1905 contained material relating to the theory of relativity, E = mc2, Brownian Motion and photoelectric effects. His Theory of Critical Opalescence publication explains, among other things, why the sky is blue. His Modern Quantum Theory was an upgrade to quantum theory and mechanics. Albert Einstein passed away on April 18, 1955 at the age of 76. His death came as the result of an abdominal aortic aneurysm after he refused a potentially life-saving surgery. He explained he was ready to go and would prefer to do so in an elegant manner. Unbeknownst to his family, his brain was removed prior to his cremation in hopes of discovering the source of his pronounced intelligence.